MilfordMD Cosmetic Dermatology Surgery & Laser Center, in Milford, Penn., is hosting a seminar, open to the public, on breakthrough radiofrequency-based ThermiTight and ThermiSmooth treatments. The October 4, 2016 seminar starts at 5 pm and includes not only education and demonstrations, but also gift bags with cosmetic goodies and exclusive treatment discounts for those who attend. ThermiTight & ThermiSmooth are dramatic breakthroughs in micro and non-invasive skin tightening treatments. Our educational seminar will help spread the word about these new and exciting technologies. Using the ThermiTight device, Dr. Buckley achieves subdermal (under the skin) tissue remodeling by inserting a tiny probe to gently heat the tissue being treated. That might be to tighten skin and address loose, sagging areas around the neck, neck, arms, abdomen, thighs or knees. Dr. Buckley applies the controlled amount of thermal energy to shrink the tissue. The result is a more contoured neckline, lifted breast or less sagging under the arms, on the thighs or knees. “We monitor the temperature throughout the in-office procedure with an infrared camera, so it’s effective and safe,” Dr. Buckley says. “Patients see notably tighter, more youthful looking shapes and contours on their body and neck, and the results last months—even years,” Dr. Buckley says. For ThermiSmooth no aftercare is needed. For ThermiTight, patients wear a light bandage around the treated area for up to three days, but most can resume normal activities the day after treatment, Dr. Buckley says. Not only does the radiofrequency technology of ThermiTight tighten the tissue, but it also encourages collagen and elastin production in the skin, which makes it look and feel more youthful, according to the cosmetic surgeon. ThermiTight can be done alone to address areas of skin laxity or in combination with other procedures, such as those to address fat removal or cellulite reduction. “We find ThermiTight works well with laser-assisted liposuction procedures such as Prolipo or Smartlipo. Those procedures use small cannulas to minimally invasive suction fat cells and rid the body of unwanted fat. Adding ThermiTight can improve results by providing additional tightening of loose skin, leading to a shapely body sculpting outcome,” he says. 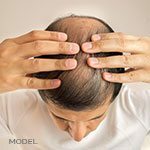 ThermiSmooth also relies on radiofrequency energy to shrink and tighten tissue. But rather than insert the probe under the skin, Doctors Richard and Marina Buckley use ThermiSmooth to heat tissue from outside the skin. 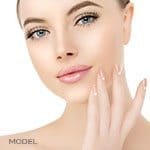 As an added benefit, ThermiSmooth, like ThermiTight, treatment encourages collagen remodeling, which helps skin in the treated area to look and feel healthier, according to Dr. Buckley. 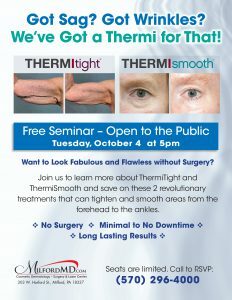 While the MilfordMD October 4th special presentation on ThermiTight and ThermiSmooth is free and open to the public, seating at this event is very limited and reservations are required. To reserve your spot, call MilfordMD Cosmetic Dermatology Surgery & Laser Center at (570)296-4000.